This page is intended to help you search this site and the forum to find topics that interest you, or to find a thread you participated in previously but can't seem to find any more. To search the entire OzPolitic website, use the search box on the top left of this page. To search the forum posts from the last week, use the search bar on the top right of the forum home page. 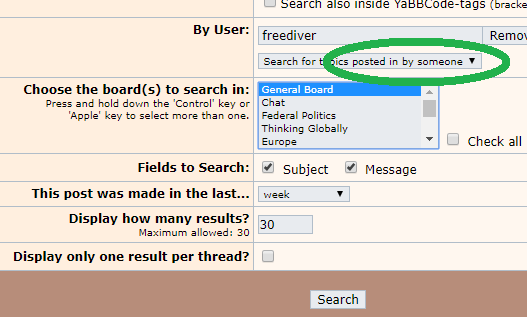 To search the forum for posts by a specific user, on a specific board, within a particular time frame, use the search button in the menu (direct link). See the images below for how to do this. In particular, note that to search for posts by someone, you must select the option "search for topics posted in by someone". To find a specific member, try here: http://www.ozpolitic.com/forum/YaBB.pl?action=ml. 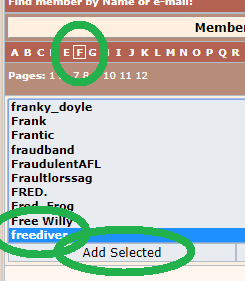 The members can be listed by name, number of posts or registration date by clicking on the column title. To view the recent posts by any member, click on their name and use the tool at the bottom of their home page. Note that you need to be signed in to your forum account to access their home page. To view more threads, change the number 20 in the URL to a higher number. Browse all of the images that have been uploaded to the forum by members. Browse the entire gallery. You can have your own folder here to upload photos. Contact the admin via the feedback board on the forum for more information.